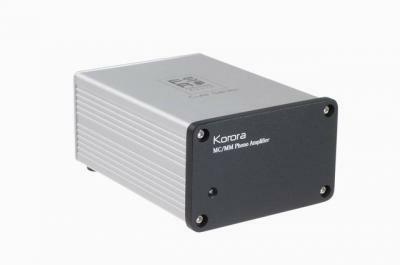 Korora MC/MM Phono AMP audio amplifier from Firestone Audio Co., Ltd.
Hi-Fi Amplifier > Korora MC/MM Phono AMP > Firestone Audio Co., Ltd.
Korora is a kind of MM/MC Phono Amplifier with RIAA Filter. Adopting recharge circuits and high performance Ni-MH battery make Korora can be run by the inside battery (high S/N). According to the different standards of cartridge, the users can select the appropriate model by adjustments of impedance and capacitance. Four types of gain control can make the user easily adjust the power or amplitude of a signal. Korora MC/MM Phono AMP > Firestone Audio Co., Ltd.